Anyone who used computers in the 80s are familiar with mechanical keyboards – aka – Clicky keyboards. Most of us fell in love with the solid feel and smooth flow those keyboards offer and searched long and hard to find keyboards that came close to matching that crisp and clean feel instead of the ‘mush’ most modern membrane keyboards offer. 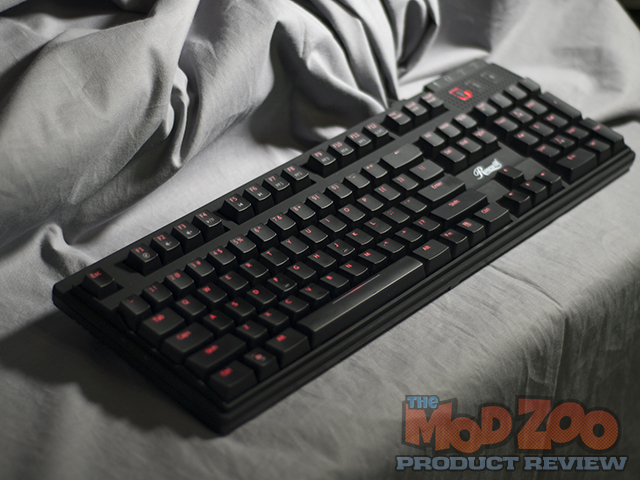 Rosewill’s RK-9100xR keyboard, also known as the APOLLO, is their latest mechanical keyboard offering, this time equipped with the Cherry MX Blue switches. Weighing in at the time of this review at around $150 dollars, it personally feels a bit spendy for a keyboard. Let’s see if it lives up to the price point. I’m in serious need of new KB, and this sounds like great deal. I was extremely skeptical of the price point going in, but so far, it’s proving to be well worth the investment. If it holds up to the abuse, this is a keyboard that very well should outlive a few PCs. I purchased the k70. It has basically the same ascetics except mx red switches and I think a bit cheaper. Will admit the feature set looks really nice on this one, and even though the price tag seems right for the features, for some reason it does not seem right for the brand. This is the same keyboard as the Max Nighthawk.